Pink eye is the common name for an eye condition called conjunctivitis. Pink eye is inflammation and irritation of the conjunctiva part of the eye. The conjunctiva is a thin membrane that covers the white part of the eyes and the eyelids. The purpose of the conjunctiva is to keep the surface of your eyes moist and protected. Usually, the tiny blood vessels contained within the conjunctiva are very difficult to see. However, conjunctivitis causes these blood vessels to expand and turn the white parts of the eyes red. Pink eye can develop in one or both eyes. This is the most common type of pink eye and is contagious. The virus associated with viral conjunctivitis is the same virus which causes symptoms of a runny nose, sore throat and watery eyes that are prevalent with colds and flu. This type of pink eye is caused by bacterial infectionssuch as Staphylococcus or Streptococcus and is contagious. Bacterial conjunctivitis causes one or both eye to become red and may discharge mucus. Antibiotic eye drops are typically used to treat bacterial conjunctivitis. This type of conjunctivitis is caused by something that triggers an allergic reaction such as pollen or an irritant like smoke or fumes. 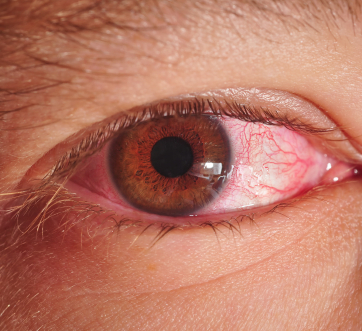 Unlike other types of pink eye, allergic conjunctivitis is not contagious. This form of pink eye is characterized by redness, burning, itching, tearing and swollen eyelids. Antihistamines are often used to treat this type of conjunctivitis. – Failure to wash hands frequently. Then touching or rubbing eyes. – Use of a hand towel that has been used by somebody who has pink eye. – Use of cosmetics after they have been used by someone with pink eye. – Failure to clean contact lenses properly. Children are particularly susceptible to pink eye given their close contact with other children in school, sports and other activities. – Foreign objects in the eye. – Injuries to the eye. – Dry eyes or lack of tears. – Infections in or around the eyes. Regardless of whether the eye condition is pink eye or red eye, a visit to your eye doctor for proper diagnosis, treatment and guidance is important.